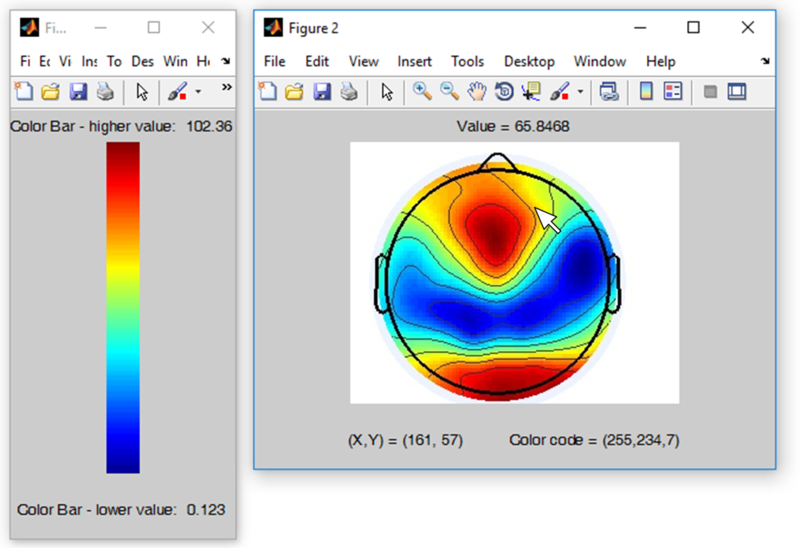 - Colour picker and data extractor from colour bar, colour map and heatmap plots. - I have used this tool to extract data from figures of scientific papers. - It can be used as a tool to (preliminary) estimate and evaluate data during systematic reviews and meta-analysis. This tool can be downloaded from MATLAB File Exchange website or you can contact me. Main routine. Use this file to configure and run your experiment. variable "myTargetImage": path to the image that you want to explore and pick values using the mouse. variable "myColorBarImage": path to the image that you want to use as reference colour bar. Linear scale. variable "myColorBarImageLowValue": scalar value representing the lower value of the reference linear colour bar. variable "myColorBarImageHighvalue": scalar value representing the higher value of the reference linear colour bar. Routine that is executed every time you mouve the mousse over the target image. You can use the custom "myKnnSearch.m", native "knnsearch.m" or other multi-dimensional search criteria. Routine that is executed to search the nearest colour (Euclidean distance) to the picked pixel in target image and estimate the corresponding colour bar value. Example of a colour bar. Colour bar should be oriented verticaly and represent a linear scale. Lower value at the bottom. Higher value at the top. Colour bar and target image should be both RGB images or grayscale images. Best option to get a good version of a colour bar is to printscreen the source of that colour bar: eg: a scientific paper. Example of a target image, which is going to be explored by mouse. Best option to get a good version of a target image is to printscreen the source of that target image. eg: a scientific paper.